Snow has been widespread over the last week and skiing conditions have dramatically improved both on and off the piste. The heaviest snow has once again been reported in France and Switzerland, but Italy and Austria have also benefitted. Base depths at many of the French ski resorts have been increasing by the day. More than a metre of powder has been recorded over the last 7 days in Val Thorens, Flaine, La Rosiere 1850, Chamonix, Val d’Isere, and La Plagne. See our full France 7-day snowfall total. 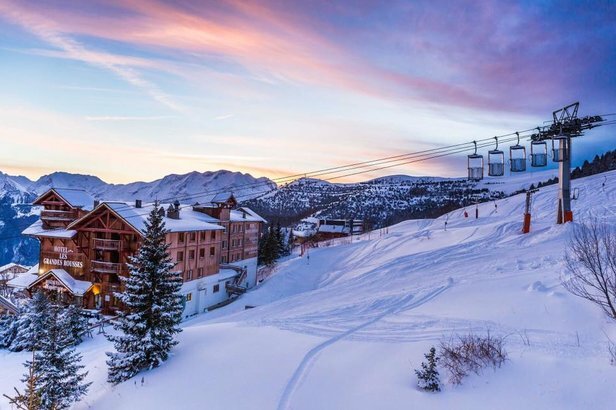 The Northern French Alps continues to dominate the snow depths chart, with some of the best skiing in Europe right now at Val Thorens (155-220cm), La Rosiere (115-220cm), Meribel (95-215cm), Alpe d’Huez (92-200cm), Courchevel (109-193cm), La Plagne (105-190cm), Val d’Isere (113-190cm) and Tignes (113-190cm). See our full France snow depths. Austrian ski resorts have been transformed by the recent snowfall, which has fallen regularly throughout the week. The Arlberg resorts of St. Anton and Lech-Zuers have seen 70-85cm of fresh snow this week. See our full Austria 7-day snowfall total. Some of the best skiing at present can be found in Warth-Schrocken (155-185cm), Flachau (50-100cm), Obertauern (50-70cm), St. Anton (75-165cm), Lech-Zuers (95-110cm), and Zell am See (30-95cm). See our Austria snow depths. Swiss ski resorts have had a good week with more than a metre of snow falling in Engelberg, Melchsee-Frutt, La Fouly and Anzere. Substantial dumps were also recorded in Verbier, Champery, Les Crosets and Leukerbad, all of which had around 80cm. See our full Switzerland 7-day snowfall total. Some of the best skiing at the moment can be found in Crans Montana (57-280cm), Engelberg (55-255cm), Anzere (130-230cm), Nendaz (60-210cm), Saas Fee (70-200cm), Zermatt (25-180cm) and Laax (30-185cm). See our Switzerland snow depths. Snow has fallen across much of the Italian Alps over the last 7 days, with some of the heaviest dumps reported at Cervinia-Breuil (85cm), La Thuile (75cm), Courmayeur (55cm), Cortina d’Ampezzo (45cm) and Madonna di Campiglio (45cm). See our full Italy 7-day snowfall total. Some of the best skiing can be found at Cervinia-Breuil (140-230cm), Courmayeur (110-180cm), La Thuile (65-150cm) and Pila (60-120cm). Light snow has also fallen in the Milky Way resorts with base depths 0-40cm, but a lot more is needed for all terrain to open, currently only 97/238 runs are open. See our Italy snow depths. While no new snow has fallen in Andorra this week, temperatures have remained low which has helped maintain the snow and nearly all lifts and slopes are open: Grandvalira (25-60cm), Vallnord/Arcalis (40-70cm) and Vallnord/Pal-Arinsal (40-60cm). No new snow has fallen in Bulgaria this week and pistes are hard-packed. The best conditions can be found in Borovets (40-60cm) and Bansko (20-65cm).